Every year many thousand people die world over due to genetic disease blood cancer. Considering the grimness of the situation, great medical teams and researchers are continuously striving to wipe out this killer-disease ‘blood cancer’. One of the Ph D students Yogender Shokeen from the School of Biotechnology & Bio-Sciences of Lovely Professional University has also been working on such a research project continuously for last 3 years to identify changes in gene responsible for blood cancer. Impressed by his important findings, European Cancer Congress has selected Yogender for a Fellowship Grant to attend its 18th ECCO - 40th ESMO conference to be held in Vienna (Austria) from 25-29 September 2015. LPU student has been specially invited to present his research work, which has got major breakthrough for checking blood cancer in future by having further researches on his findings. 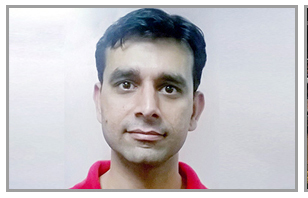 LPU scientist has researched on Chronic Myeloid Leukemia (CML) type of blood-cancer. LPU Chancellor Mr Ashok Mittal congratulated the young researcher of the university who is on the lines of bringing great relief to the ailing global society. Facing one by one three deaths in the family (of his father, father’s elder & younger brother) due to cancer, LPU researcher is alert and determined to analyze the root cause of this dangerous disease. He does not want others to suffer as he has himself suffered irreparable loss. Explaining scientifically, Yogender informed: “Cancer is a disease caused by certain changes in some genes called proto-oncogene. It is a gene that has the potential to cause cancer. Along with these genes several other molecular pathways also play important role in causing cancer. In simple terms, malignant activation of a gene is associated with the continuing conversion of normal cells into cancer cells. My study is based on examining the significance of a pathway called “TGF-B-Smad pathway” in CML patients. good As we have discussed most of all water softening systems contain three components water softeners reviews During the last phase the mineral tank flushes out the excess brine and then refills ,nice. good With the Aquasana brand, you know that you're obtaining a lot of great worth for the cash. best water filter It features a sophisticated filters that reduces chloramines in the water, nice. good your wireless carrier never made the update available to https://iplaystoreapp.com discover a complimentary download for the Play Store APK nice.